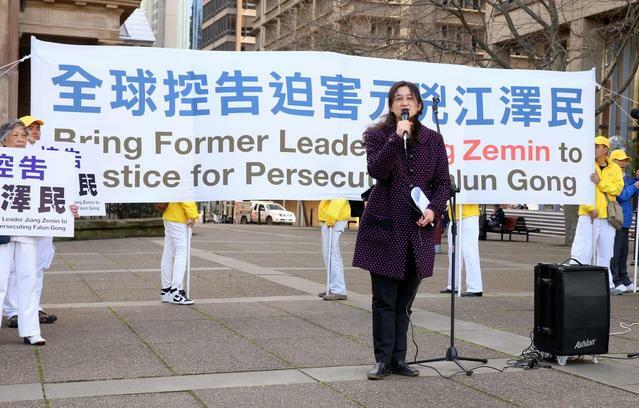 ﻿ Sydney, Australia: Bring Jiang to Justice! 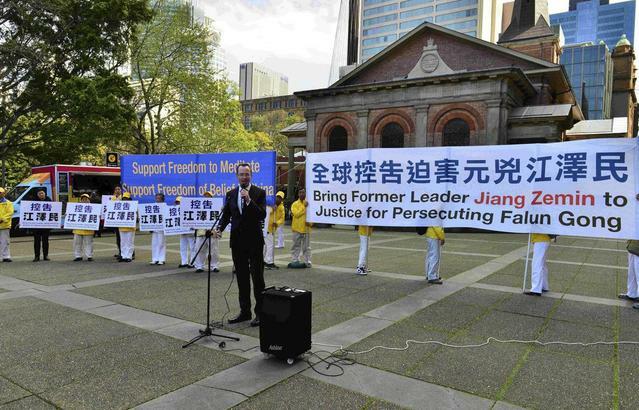 The rally raised awareness of the 16-year persecution of Falun Gong in China and was also a show of support for the thousands of lawsuits against Jiang Zemin, former head of the Chinese Communist Party, for his abuse of power in orchestrating the persecution. 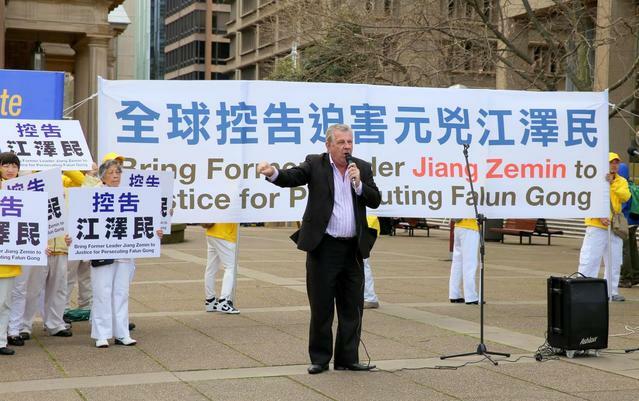 John Deller, spokesperson for the Australian Falun Dafa Association, was the rally's emcee. He announced that more than 160,000 people have filed criminal complaints against Jiang within the past three months. Speakers at the rally includes Dr. Lucy Zhao, Chair of the Australian Falun Dafa Association, Huiqiang Pan, Chair of the Victoria Falun Dafa Association, David Shoebridge, a Greens Party member of the New South Wales Legislative Council, Stephen Sim, human rights advocate and senior radio host for FM 99.3, Andrew Bush, a senior member of the Liberal Party, and three Falun Gong practitioners who suffered persecution in China and have filed complaints against Jiang. The Divine Land Marching Band, composed entirely of Falun Gong practitioners, performed prior to the start of the rally. Dr. Zhao continued, “And in Australia, more than one hundred people have filed complaints. Thousands of people have signed the petition to support the lawsuits against Jiang Zemin. This is a very important moment in history. It will be remembered by the people of the future. “The crime conducted by Jiang Zemin is a serious one, against Chinese law. It's a serious violation of international human rights conventions. It's also a big challenge to conscience and justice, to all human beings, to all of us. David Shoebridge, a Greens member of the New South Wales Legislative Council, submitted a bill, the New South Wales Human Tissue Amendment（Trafficking in Human Organs）Bill 2015, to the Provincial Parliament. The purpose is to pass a code to charge those involved in unlawful organ trafficking. “I have seen you in sunshine, in rain, in hail, and in wind, making a pretty simple statement in support for dignity, which I fully endorse,” said Mr. Shoebridge in his speech. “No matter which country you live in, you should be entitled to the basic human rights, to be able to have your own spiritual, personal and religious beliefs, free from interference from your government. And to be free from the very clear criminal persecution that practitioners of Falun Gong suffer in China. “Leaders in this country who put their hand up and say they believe in a legal democracy, that every political leader, regardless of their political colours should be here supporting you in your cause. “The basic humanity is denied to practitioners of Falun Gong when they’re imprisoned because of their beliefs. They are singled out to be the source of forced organ harvesting that are then used for a full-profit within China. People from Australia, from the US, wealthy members of the Chinese community then have access to organs. “When will we join together as a globe and say enough’s enough? When will enough political leaders have the courage to stand up to the Chinese government and simply say 'you must respect universal human rights'. 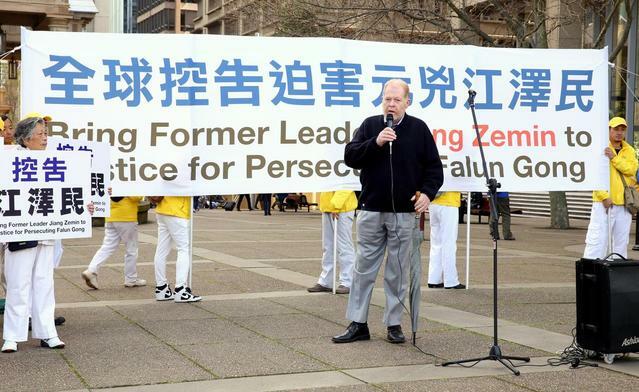 Andrew Bush, a senior member of the Liberal Party, said in his speech that he was speaking out as an ordinary Australian against the persecution of Falun Gong practitioners. He continued, “If the same thing was happening to a penguin in Antarctica, the whole would be up in arms. Because this is happening in China to ordinary human beings, the world turns its back. That means there are two wrongs going on: we who turn our back as citizens are wrong, when people need our support, and what’s going on in China is wrong. “I hope that ordinary Australians can no longer be ignorant but stand up to what is going on, so that the Chinese Government gets the message that what they are doing is wrong, and can never be justified. They need to be held accountable for the wrong that they have done, without reservation. “I know there is a lawsuit against Jiang going on in China. What I have suggested and what I hope will happen is that the same case will be run through the international court. It will put huge extra pressure on China. Stephen Sim recalled the collapse of the Eastern communist bloc in his speech. He condemned the persecution of Falun Gong in China.